Blue-green deployments are a pattern whereby we reduce downtime during production deployments by having two production environments ("blue" and "green"). One of the challenges with automating deployment is the cut-over itself, taking software from the final stage of testing to live production. You usually need to do this quickly in order to minimize downtime. 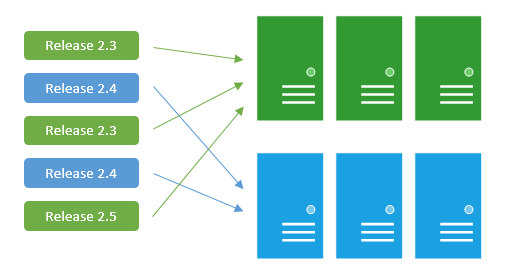 The blue-green deployment approach does this by ensuring you have two production environments, as identical as possible. At any time one of them, let's say blue for the example, is live. As you prepare a new release of your software you do your final stage of testing in the green environment. Once the software is working in the green environment, you switch the router so that all incoming requests go to the green environment - the blue one is now idle. Staging: when blue is active, green becomes the staging environment for the next deployment. Rollback: we deploy to blue and make it active. Then a problem is discovered. Since green still runs the old code, we can roll back easily. Disaster recovery: after deploying to blue and we're satisfied that it is stable, we can deploy the new release to green too. This gives us a standby environment ready in case of disaster. 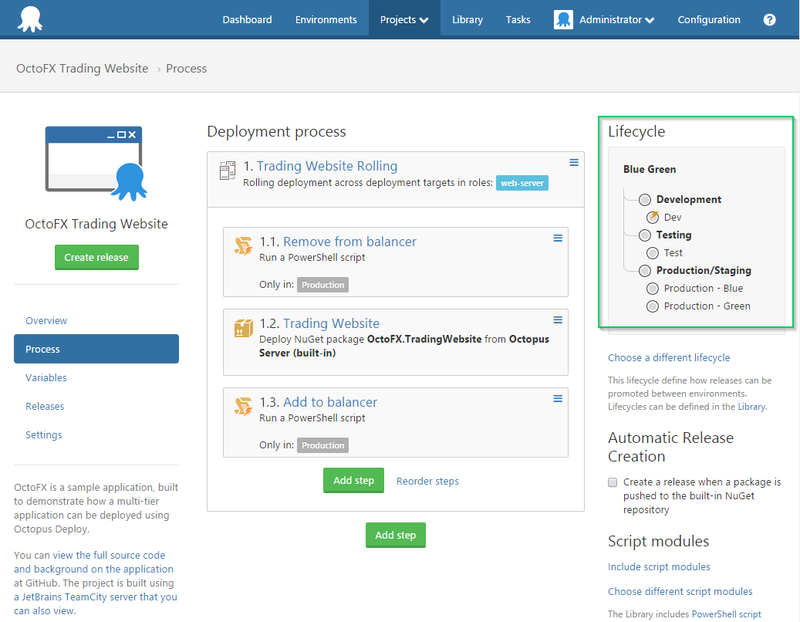 When deploying, you can then choose which environment to deploy to - either blue or green. The dashboard will show which release is in each environment. Configuring your lifecycle will need to be done accordingly. Typically you would have both your blue and green environments in a shared "Production/Staging" phase.